Pitt Professor Zachary Horton holds up the overlay for the Odyssey game Haunted House. The OdysseyNow project is spearheaded by University of Pittsburgh Professor Zachary Horton, and is the largest endeavor ever undertaken by Pitt's Vibrant Media Lab. The Magnavox Odyssey was released in 1972 (predating Pong) for home use, and about 350,000 of them were sold before, as Horton says, it faded into obscurity. "People don't actually play it anymore, which is unlike almost every other video game system," he said, noting old systems like Nintendo have evolved with new generations, and some defunct consoles like Atari maintain a nostalgia factor. 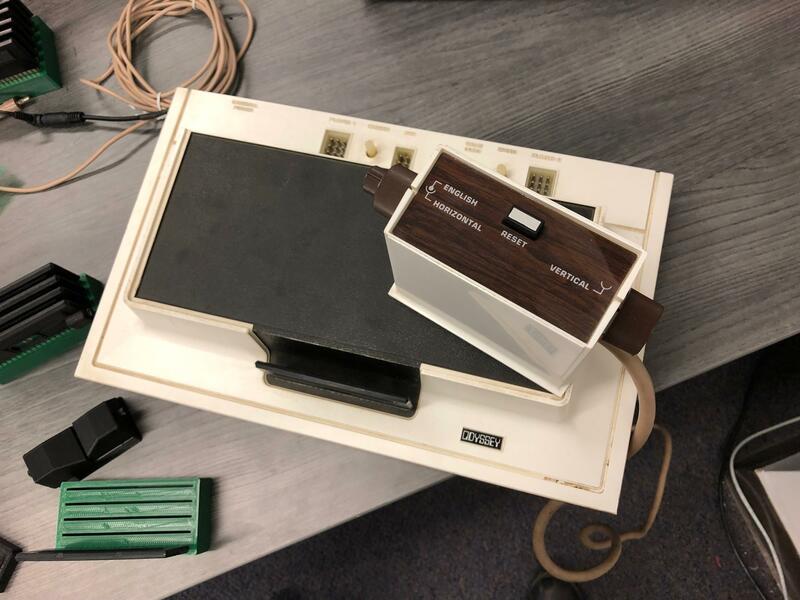 Despite disappearing from the public eye, Horton says the Magnavox Odyssey had innovative aspects that haven't really been seen since -- games came with plastic overlays to stick onto the TV screen, and some included tangible pieces like cards or game boards, so gameplay happened both on and off screen. "It's actually not easy at all, people who are used to current video games have a really hard time controlling and understanding these games," Horton said. "And part of the reason is that they're very complex." Pitt students who have participated in the two-year project have helped recreate the console from scratch, using circuit boards and 3-D printing. They're also creating their own games and controllers for the modernized system. Horton said all the games and elements the lab has accumulated and created have been scanned at a high resolution. This semester, the team will set up a website where anyone can download the open source materials, so a person could build it themselves. "One of our main missions is to give people around the world an opportunity to actually play this system that is otherwise very rare and very difficult to both find and get working," Horton said. "We want to make it accessible again." In April, the lab will host a one day Odyssey Expo, where members of the public can try out the Odyssey, potentially, for the first time. For those not in Pittsburgh, the lab plans to make "Let's Play" videos for all 28 original Odyssey games, so viewers can see what gameplay on the system looks like. Gov. Tom Wolf kicked off his second term Tuesday with a call for Pennsylvanians to work together to build a stronger, fairer and more prosperous future.